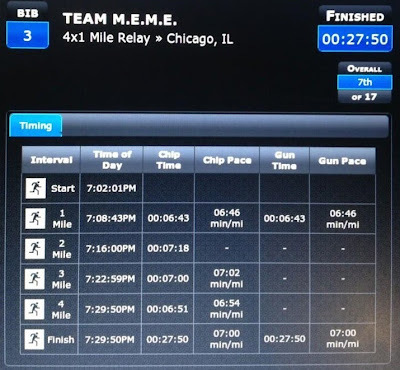 I know this is my second Nike post this week but I have to tell you about the awesome Get Fly Nike Chicago 4x1600m relays last night! The whole program was to launch the Nike Free Flyknit and improve 1-mile times over the course of a month. 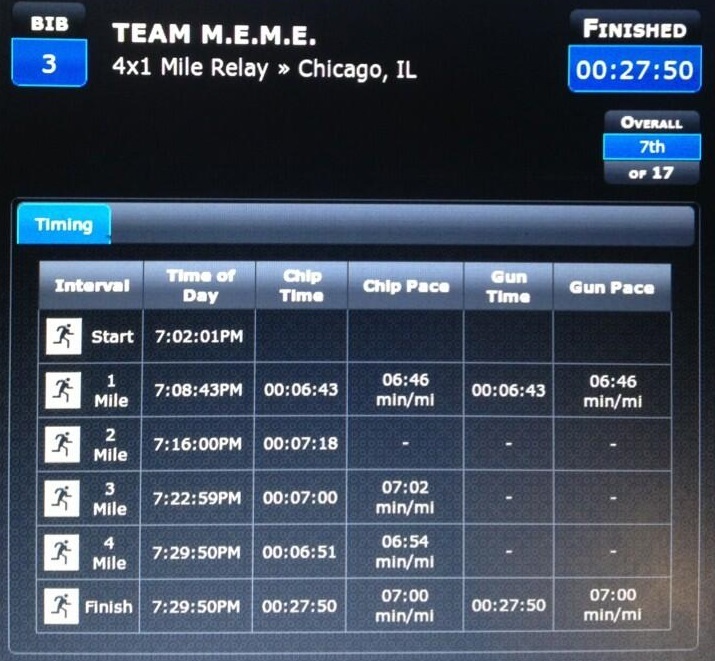 I missed the kick-off event a month ago because I had kickball but I was still able to sub on Team M.E.M.E. with some of the other girls from NTC Lincoln Park. First of all, we got to try on the Nike Free Flyknit for the run. They have a pretty cool stretchy upper that molds to your foot and doesn't require socks. I thought they were ok to run with but my calves were burning, which doesn't usually happen. There were a total of 17 relay teams. Nike closed down the Lakeshore Park Track and had a stage set up with an MC and DJ and music! Our heat at the starting line! Rhoda, not on our team, but a friend from NTC was the only one I could get with my iphone. All the other pics were too blurry! 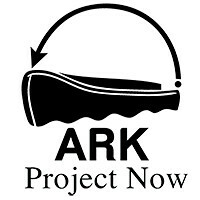 Finally, our team! Lauren had already left at this point but Jennah is in the middle and Eileen is on the right. 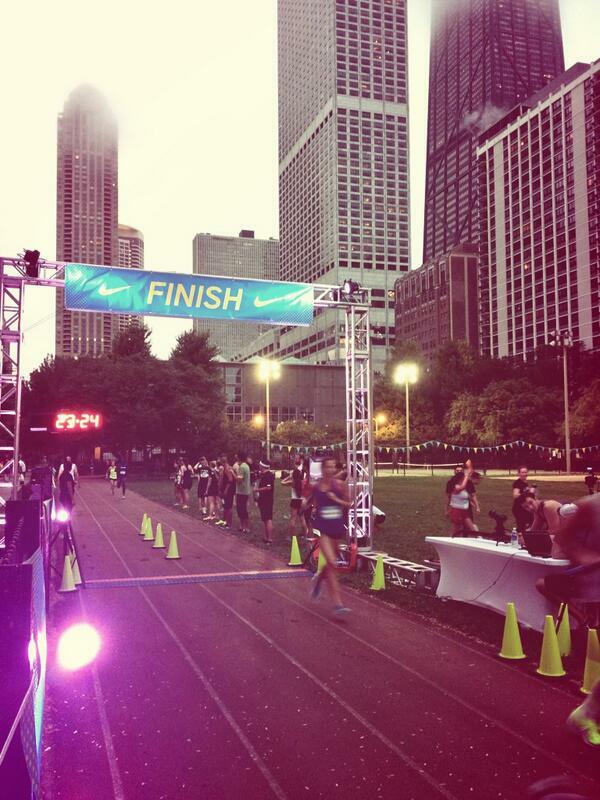 I had a lot of fun doing this event and I hope Nike Chicago and/or NTC LP do more! It really made me miss high school track meets. Are there any amateur adult track leagues?? When is the last time you did a relay race? What is your 1-mile PR? I've been meaning to run a mile and find out! This was my first relay since high school and it was so fun! Although I run longer distances now, I was definitely faster in high school. Thanks for stopping by and I'll check out your blog! Friday Favorites - in Seattle!